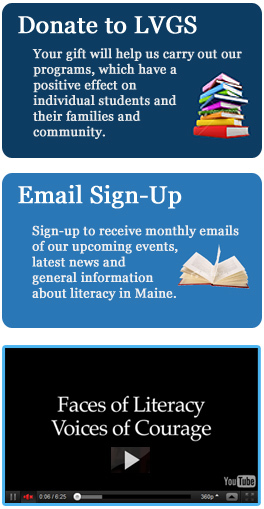 Welcome to the website of Literacy Volunteers of Greater Sanford! Our mission is supporting the needs of adults, especially those reading below the ninth-grade level, with free, confidential one-on-one tutoring by trained adult volunteers. Our approach is student-centered so that literacy goals match life goals related to the family, employment and citizenship. Whether your goal is to gain better skills for a job, help a child with homework, read the label on a prescription bottle, or become a volunteer, we hope you will contact us. 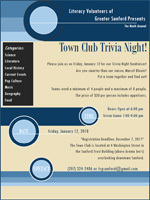 February 18, 2019 - On behalf of Literacy Volunteers of Greater Sanford, thank you very much to everyone who took part in and supported our Trivia Night at the Town Club event on Friday, January 18! We had a great turnout of 120 people playing on sixteen teams. Special thanks to Shawn Sullivan for being our terrific new emcee, Gina and her team at Above and Beyond Catering for superb food and hospitality, all the donors to the raffle and live auction, and everyone who played the trivia game with great spirit, bought raffle tickets and bid on auction items! Our sponsors were: Kennebunk Savings Bank, Moody's Collision Centers, Sanford-Springvale Altrusa, Sanford Lions, SIS Bank, York County Federal Credit Union and YRL Group. This was our tenth annual Trivia Night and produced a net of $5,200 for our programs offering free, one-on-one tutoring to adults. With strong community support, we've raised over $38,000 with this event over the years. Thank you, one and all, for making this possible! Please mark your calendars and join us for next year's Trivia Night on Friday, January 17, 2020! © 2016 Literacy Volunteers of Greater Sanford. All rights reserved. Website Development Donated by Webheads, Inc.